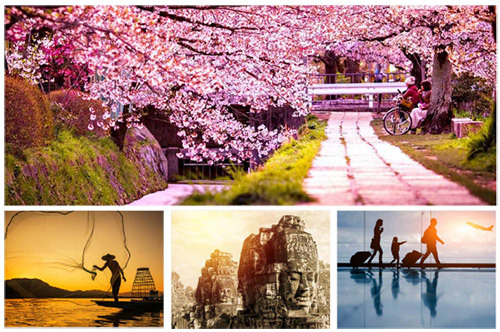 The Asia Vacation Group designs fully-inclusive, authentic tours to Japan and Indochina that ensure excellent service and a holiday tailored to suit your expectations. You will be accompanied by friendly travel experts who take care of all the details. English-speaking tour guides provide valuable insights into the history, culture and customs of each region, adding a friendly, personal and authentic depth to your holiday experience. These expertly designed itineraries combine group touring with free time and flexibility. Optional excursions are available with each tour. With 20 years’ experience in the region, the Asia Vacation Group has developed strong relationships with hotels. Properties are quality inspected to ensure the best value, with an emphasis on the authenticity of your holiday experiences. From modern & convenient hotel rooms in large cities to lovely, warmhearted local houses, you can be assured of a comfortable night’s rest. Why not add on an exotic stay at the end of your all-inclusive tour? Sapa with magnificent rice terraces; Nha Trang, Phu Quoc & Mui Ne with white-sand beaches and tranquil water; Bustling capital Phnom Penh, magnificent Sihanoukville peninsula and mystical Angkor Temples; Japan with many extra shortstays to discover. People who ordered Indochina & Japan also ordered the free travel brochures below. Click on the images to find out more about these brochures.